Two reasons for a roast! With British Beef Week underway and Easter just around the corner, there are plenty of reasons to indulge yourself in a traditional British roast dinner. Another reason is that, after the launch of our Garlic & Rosemary Roasting Potatoes, we now have not one, but two varieties of roasties for you to enjoy! Our Farmer’s Roasting Potatoes, like all of our products, are only ever produced using British potatoes. Made just as you would at home, they’re par-boiled, tossed in rapeseed oil and perfectly seasoned before being roasted then frozen. All you need to do is pop them in the oven! With our new Garlic & Rosemary Roasting Potatoes, we’ve taken the taste to another level by tumbling the roasties in Yorkshire Cold Pressed Rapeseed Oil infused with garlic and rosemary. One thing our roasties have in common, apart from the fact that they’re both delicious, of course, is that we’ve left the skins on. We’ve been making roast potatoes for some time but in these times of waste watching, we began to wonder why we were scraping the best bit off. 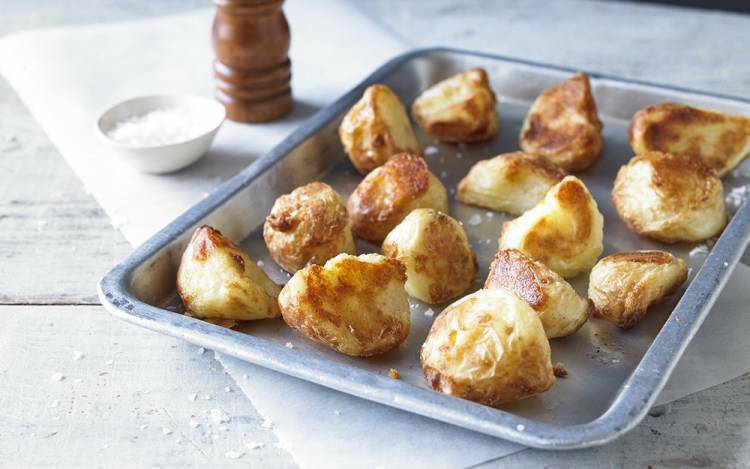 The skins really add to the delicious crispiness of our roast spuds and contrast perfectly with the soft fluffy middles. Of course, it’s the skins where many of the nutrients are too, not least dietary fibre which has recently been identified by The Lancet as essential for a healthy diet. Also, unlike many other roast potatoes you’ll find in the frozen aisles, our roasties are gluten free, as well as being suitable for vegetarians and vegans, so whatever you choose as the focus of your roast dinner, from spring lamb, or roast beef to roasted cauliflower or mushroom and chestnut wellington, our roasties are potato perfection on a plate.